Turbid Qi is also called "Evil Qi" or "Pathogenic Qi," and refers to any murky energy which can originate either from within or from outside of the body's organ system. For example, while Transforming and Transporting energy, the body divides ingested and absorbed food substances into Clear and Turbid Qi. After separating the Clear Qi from the Turbid Qi, the body keeps and redistributes the Clear Qi and disposes the Turbid Qi through the Yang Organs. Internally, naturally Turbid Qi attaches itself to the body's "wounds" (i.e., physical, emotional, or spiritual), manifesting as a dark, discolored vaporous cloud of energy. This energy can adversely affect the body's physical, emotional, and energetic balance, especially when combined with any pathogenic internal or external factor. Figure 1: The Turbid Qi will move With or Against the energetic flow of the Channel. 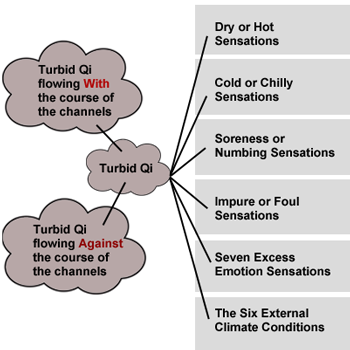 Figure 2: The various energetic sensations and classifications of Turbid Qi. In the Medical Qigong Clinic, feeling the energetic sensations of Turbid Qi is sometimes referred to as "Pathogenic Sensing." This important diagnostic skill is acquired while scanning the various types of energies existing within and surrounding a patient's body. This enables the doctor to diagnose and categorize the patient's energetic imbalance according to the various sensations, density, and location of the Turbid Qi he discovers. • Flowing With the Channel: Turbid Qi flowing within the course of the channels, indicates the transference of Turbid Qi moving towards the body's interior. • Flowing Against the Channel: Turbid Qi flowing against the course of the channel indicates the beginning production of Turbid Qi. 1. Dry or Hot Sensations: These sensations are considered Yang signs or Symptoms of Heat. This type of Turbid Qi feels feverish and flaccid; it can cause perspiration and irritation. Feeling the various sensations of Dry-Heat on a patient's body, can often cause the doctor to fidget, as if being scorched by a Fire. These sensations may also serve as an indicator of Excess Heat Syndromes, and hyperactivity of Fire due to a Yin Deficiency. 2. 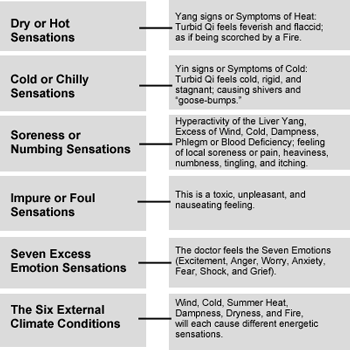 Cold or Chilly Sensations: These sensations are considered Yin signs or Symptoms of Cold. This type of Turbid Qi feels cold, rigid, and stagnant. It may be so cold, that the doctor's fingertips immediately turn cold. Feeling the various sensations of coldness on a patient's body can often cause the doctor to shiver, and have "goose-bumps." These uncomfortable feelings often serve as an indication of Deficiency and Cold Syndromes. Which can manifest within the body as rheumatism, rheumatoid disease, or Deficiency of the Kidney Yang. 3. Soreness or Numbing Sensations: These sensations often indicate Syndromes of hyperactivity of the Liver Yang, Excess of Wind, Cold, Dampness, Phlegm or Blood Deficiency. When feeling these various sensations, the doctor may experience an uncomfortable feeling of local soreness or pain, heaviness, numbness, tingling, and itching. 4. Impure or Foul Sensations: These toxic sensations can be felt when the doctor is standing opposite certain patients, or when he extends his energy into certain patients bodies. This is a toxic, unpleasant, nauseating feeling. 5. The Seven Emotional Sensations in Excess: The sensations of the Seven Emotions (Excitement, Anger, Worry, Anxiety, Fear, Shock, and Grief) can cause discomfort to the doctor. During treatment, the doctor may detect and feel the different natures of these emotional pathogenic Evils flowing through his body. For example, the doctor may have a feeling of Anger suddenly arise within his body, especially if the patient's illness is due to suppressed Anger. This is why, once these pathogenic emotions are discovered, the doctor must immediately purge or disperse them, and determine their origin, and cause. 6. The Six Climate Conditions: The Six External Climate Conditions (Wind, Cold, Summer Heat, Dampness, Dryness, and Fire) can also cause discomfort to the doctor. During treatment, the doctor may detect and feel the different energetic natures of these Pathogenic Evils. For example, the doctor may feel that he is dipping his hands into slippery wet ooze, especially if the patient's diseased condition is due to Dampness. • For Excess and Rebellious Qi - Reduce Excess and Subdue Rebellious Qi. • For Deficient and Rebellious Qi - Tonify Deficient and Subdue Rebellious Qi. • For Excess and Stagnant Qi - Reduce Excess and Move the Stagnant Qi. • For Deficient and Stagnant Qi - Move the Stagnant Qi and Tonify Deficiency. • For Excess and Deficient Qi - Drain Excess and Tonify Deficient Qi. • For Rebellious and Stagnant Qi - Subdue Rebellious and Move the Stagnant Qi. This entry was taken from The Secret Teachings of Chinese Energetic Medicine, Volume 3: Developing Intuitive and Perceptual Awareness, Energetic Foundations, Treatment Principles, and Clinical Applications. The International Institute of Medical Qigong Publishing House, 2014. Editor's Comments: The subject of this entry is Xie Qi, pronounced shay (rising) chee (falling). In Simple then Traditional Chinese Script it is 邪气 / 邪氣. In Pinyin it is xié qì. The dictionary meanings are turbid, pathogenic, evil; the unhealthy energetic imbalances that lead to disease. It is in contrast to the body's vital energy (Zheng Qi) which resists disease.